^ "Winter 03-04: A Ship for the Sea". Cruise Industry News. Retrieved 2012-05-23. 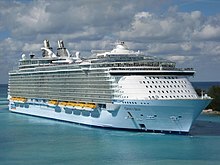 ^ "Royal Caribbean orders .24B cruise ship - Boston.com". Archived from the original on 20 February 2009. ^ "Internet Archive Wayback Machine" (PDF). Wayback.archive.org. Retrieved 2012-05-23. ^ "Glossary, definition of Passenger Space Ratio". Information and Explanations. choosecruising.com. Archived from the original on 2010-08-29. Retrieved 2007-12-28. ^ "Cruise Ship Tonnage". 123Ttravel.com. Archived from the original on October 11, 2007. Retrieved 2007-12-28. ^ "Queen Mary Home". Atlanticliners.com. Retrieved 2012-05-23. ^ "Queen Mary 2 (9241061)". Ships In Class. Lloyd's Register. Retrieved 2012-07-19. ^ If Royal Caribbean builds it, 6,400 could comeBoston Globe (February 7, 2006). ^ "A ship is its 'own best lifeboat'". Lloyd's List Australia. 18 January 2012. Retrieved 20 January 2012. ^ Barry Meier; John Schwartz (February 24, 2013). "Lack of Backup Power Puts Cruise Passengers at the Ocean's Mercy". The New York Times. Retrieved February 25, 2013. ^ Reinikainen, Kari (2009-05-06). "Fred. Olsen sells Black Prince for further trading". Cruise Business Online. Cruise Media Oy Ltd. Archived from the original on 2009-10-11. Retrieved 2009-05-10. Marin, Pierre-Henri. Les paquebots, ambassadeurs des mers, collection " Découvertes Gallimard " (nº 75), série Techniques. Paris: Gallimard, 1990. Wikimedia Commons has media related to Passenger ships. This page was last edited on 14 January 2019, at 16:21 (UTC).